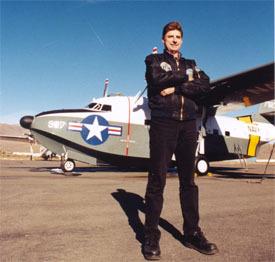 During the Week of the Albatross Splash-In (February 2nd-11th, 2001) near Boulder City, Nevada, we, Steve McCaughey and Mary Jahn, were betrothed in flight over Lake Mead aboard an Albatross on February 3rd! This wonderful strange bird, the "Gitmo Ghost" is owned by Dennis Buehn. It has been lovingly restored by Dennis from the boneyards! She is painted in her Navy colors with her serial number 927 proudly displayed on her nose! We met Dennis (pictured above) and his lovely wife, Laura, over Thanksgiving weekend, in November 2000, to begin making arrangements for this extraordinary wet, wild and wonderful wedding. The phenomenal sight when arriving at their hangar and office was every seaplane enthusiast's dream come true! There out on the tarmac were row after row of Albatrosses and other Strange Birds! What a sight to behold... A few of the old HU-16 Albatrosses were in restoration process or upgrading or, as in the case of the "Gitmo Ghost", in a state of perfection ready to roll off the tarmac, climb into the blue sky and land with a huge splash in a nearby lake! Dennis graciously showed us around his entire operation and we just fell more in love with these glorious huge flying water birds! The planning and discussions with Dennis were like sitting and listening to a wise man, spinning his tales of life lessons and always being able to see beauty in all that may at first appear ugly. That's how he found his cherished "Gitmo Ghost"... as an ugly wreck in a military "boneyard" for discarded old planes and machinery! He saw past that, to the beauty that she once was, when he worked on her in Guantanimo Bay, so many years ago, and with his loving dedication and hard work, would make possible once again! Dennis shared stories of the years working on Albatrosses, for customers who became life-long friends. He has his Warbirds business set up to make repairs and upkeep for the few precious Albatrosses still out there flying as well as those being resurrected from the Navy and Air Force salvage yards. Looking for Aviation and Pilot Gifts, Gadgets and Information?